Smokey eyes look good on all skin colors, eye colors, and face shapes. 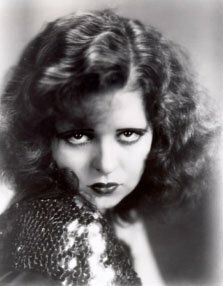 A little practice goes a long way towards getting that sultry, glamorous look down. Follow this easy, step by step tutorial, or watch the videos at the foot of this page, for further information. Step 1. Prime the lid. Eye makeup primer is a light cream or liquid that keeps your eyeshadow from running, smudging or creasing. This is especially important with smokey eye makeup, since you'll be using dark shades and don't want to smudge this eyeshadow on your face, hands or clothes. Apply it lightly all across your lid, from the eyelashes up to the browline. If you're not sure what primer to use, try using a light coat of liquid foundation, followed by powder, to set it in place. However, your mileage may vary, depending on which foundation (or powder) you use. My suggestion is, if you really want to do this makeup in five minutes, go with the primer. Step 2. Sweep the neutral eyeshadow across your entire eyelid. This eyeshadow should be a little lighter than your skin color, making the black that much more dramatic. Step 3. Apply black eyeshadow along the crease of your eyelid. If your eyelid does not have a crease, apply it along the line of your eyeball. Don't try to "paint on" a crease, though. Try to evenly blend your eyeshadow so that it gradually gets lighter as it approaches your browline. If you have light skin and hair, be careful not to go overboard; applying too much black eyeshadow can make you look like a racoon. If that's what you're going for, fine...but that might be the wrong kind of dramatic! Step 4. With a small brush, dust the silver (or grey) eyeshadow along your lash line, working upward and outward. A subtle shimmer makes your eyes stand out even more. Step 4. With a small brush, apply black, and then silver, eyeshadow under your eye. 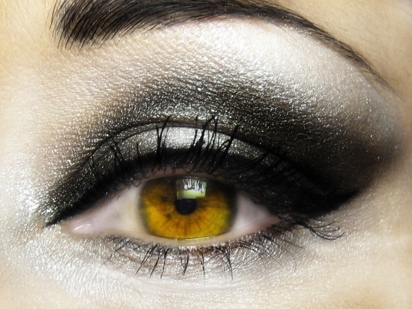 This step is optional; leaving your lower lid bare makes your smokey eyes all the more dramatic. If you want to make your eyes look large and open, though, a little black, and silver along the outside corners of your eyes, works wonders. You can also use black eyeliner along your lower lid instead. If you're not sure how to apply mascara, read our instructional tutorial here. Smokey eye makeup takes practice, practice, practice. Don't beat yourself up if you don't get it right the first time. And don't wait until the last minute to put on your smokey eyes. Aim for subtlety. It's always easier to put on a little more product than to take a little off. If you are very fair, go for a more subdued smokey look. Especially if you are a blonde, dirty blonde, strawberry blonde or light brunette. If you are very dark, consider experimenting with bright colors, such as white eyeliner, along your lidline. When done well this can draw even more attention to your eyes.